Add PropagationStats to your site. Click on the image! This is the new site of HA2MN's pages running on new server since October 1, 2014. So welcome here! The latest is a QSO with Tomi, HA7RY as KT4TTT. Tomi spent a few days in FL before heading home from Navassa dxpedition. Thank you Tomi! Finally the clip of YI9PSE with me is available to hear them in the jam of a contest. It sounds an uncertain QSO but not. Their online log proves that. Two new Hajdu QTC publications added in Hungarian. Time has come to revisit pages after four years. The question was whether to operate a ham radio station or to waste time on maintaining a home page with devoting a considerable effort to it. Of course both are important so the question is answered. As first step the site has been moved to another host. All content published earlier are preserved and available for a while. The empty pages are being filled, structural correction are being carried out. New content will be added step by step that is partly done for the time being. Please feel free to look around and come back time by time. Some new QSO audio clips have been placed on the audio page. Due to the new sunspot cycle the propagation has improved drastically and it is getting easier and easier to make myself be heard to DX stations. Though some tricks always needed, I mean to find the right calling frequency and to follow the DX's operating style. So I am to find the right "place" and the right time that makes me able to log a DX with a pileup. 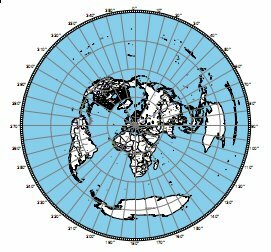 It is my azimuthal map for the whole world. I consider it useful even though I have no rotary beam facilities. Tom, NS6T's site offers free to create yours even you can give a distance centered by your QTH locator to cover a limited circle area. Due to rapidly growing sun activity the propagation has drastically changed for the better. The higher frequency shortwave bands show temporary and longer DX openings even though most of the stations are not yet so strong and they frequently vanish in deep QSB. But they can now be heard and worked after long, long years. 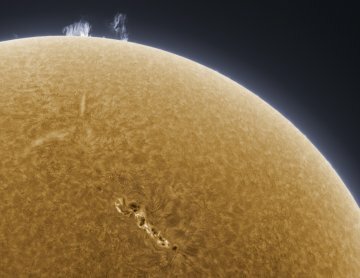 The special start of Cycle 24 put up questions on how the sun really works. Scientists scratch their heads to answer those questions while ham radio stations get to fill the earlier empty frequencies. The other day I decided to add a computer controlled PTT to my rig after long, long years to replace VOX operation. The interface needed 1 resistor, 1 diode and 1 transistor and some soldering job. I connected one of the soundcard outputs to mic input of trx. Trx AF output to soundcard line input has ever been connected to make me able to record activity on bands. All connections are direct. Since the computer controlled PTT works I am able to operate in digi modes using an UCXLog and MMVARI combination mainly. This software setup do support contest activity but it is less suitable for traditional chit-chat digi QSOs. The reason is that the length of prewritten macros is limited and a wide range of variables is not supported. You can see what I achieved for the time being (except recent contest contacts) here. New publications are available now. Q-code table (Hu, En) can be opened here as well as the Collection of Ham Traffic Abbreviations (Hu, En) here. All were compiled in PDF format. The Port City Amateur Radio Club has taken over the sponsorship of the New Hampshire Qso Party. Despite Contest Calendar the activity will be held with the same rules and times as in previous years (as written in Contest Calendar). The homepage here is being updated for more details. M-class flare occurred on Februar 8, 2010. Radio blackouts may occurre in the next few days. Cloud of particles may reach earth in a few days. Hajdu QTC is the Hungarian ham radio monthly newsreel. It is edited by HG0EK and transmitted on the third Monday of the actual month. My new series titled "The Radioamateur" is about the radioamateur activity for those who have never heard of our special hobby. Unfortunately the language is only Hungarian as the QTC targets the local ham community. Should you be interested in some publications of earlier series please click here and for monthly contents and audios click here. The homepage is under renewal after a long while. Please note that there is a frozen URL (ha2mn.hu) available still. Were you there once just click on the call sign and you will be redirected to this new site. Sorry, a good part of content is not available yet. There are a great number of the most popular Kenwood boatanchors (TS-520, TS-530, TS-820 and TS-830) on the air even today. These transceivers have their own magic but being decades old they have their own specific technical problems either. There is an international mailing list dealing with repairing and maintenance of these rigs. You can find the list here. of Amateur Radio is an international group activity to preserve ham radio for the future. The Club where I belong to (Hungarian mainly). Actual contest information week by week. The International Amateur Radio Union - The world organization of the amateur radio representation as ITU consultant.